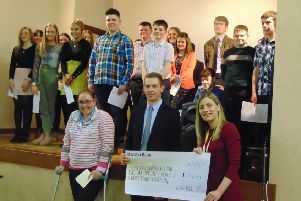 Kilrea YFC held their annual parents and friends night in 1st Kilrea Church Hall on Saurday 31st March. Members put on some of their many performances such as their arts festival performance ‘Under the Weather’. Members also showcased their singing ability through our choir who took first place at the YFC choir competiton at Loughry this year. And different sketches and poems were also used as entertainment for the audience. A big thank you goes to the clubs guest speaker YFCU president Mr James Speers who presented members with their certificated and prizes, well done everyone.